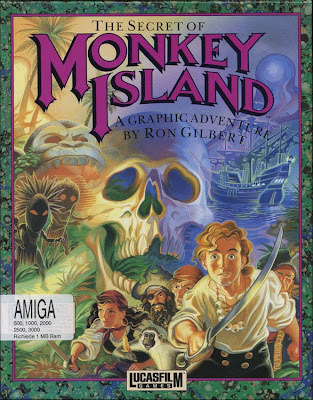 The Secret of Monkey Island was the first game in the Monkey Island series. It has four major versions. The EGA version, the VGA version (which had more realistic character closeups and got rid of the changing sun position over the harbor and changed the skeleton's description from an "emancipated Charles Atlas" due to legal concerns), the VGA CD version (which got rid of the infamous "stump joke", had high quality music on CD tracks, and gave the inventory icons for items as in Monkey Island 2). A new special edition was released in July 2009. This version updated the graphics completely in high definition in a more cartoon style, updated the music tracks to use live instruments and added ambience to scenes which were formerly quiet, added voice acting, and changed the verb and inventory system to operate in the background so the art takes up the entire screen (although the VGA CD version is playable in its entirety with a click of a button). The original datafiles can also be extracted to be used in ScummVM through the process detailed in this thread. All versions of The Secret of Monkey Island except for the special edition (although the original datafiles are supported if you extract them as detailed above) are now supported by ScummVM, a program designed to let 2D adventure games run on multiple platforms. With ScummVM, The Secret of Monkey Island now runs on modern versions of windows, as well as Linux, Mac OS X, and many consoles such as Dreamcast, Wii, PlayStation 2, and PlayStation Portable. For a complete list of platforms supported by ScummVM, see here.